16 November 2016, 4:02 p.m.
A successful foray at an earlier edition of the New Zealand Bloodstock Ready To Run Sale has fuelled further action for the Singapore based combination of Jason Goh and David Kok this year. Kok trains exciting galloper Well Done for Goh with the Falkirk gelding, who was purchased at Karaka in 2013 for $90,000, making his mark on the Singapore scene with his victory in the SGP Gr. 1 Singapore Derby back in July. 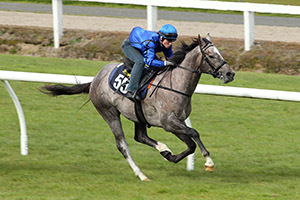 The duo were to the fore during the opening exchanges on Wednesday morning as Goh went to $280,000 to secure Lot 55, a grey colt by Brighthill Farm based stallion Dalghar from four race winner Appleton’s Lass. Offered through the Cambridge based Diamond Lodge draft the athletic colt breezed up in a swift 10.60 seconds. Identified through his initial perusal of the sale catalogue, Goh admitted he was hooked once he saw the colt in the flesh. “I saw his details in the catalogue and then liked what I saw in his breeze-up video,” he said after signing for the colt. Kok indicated the colt would remain in New Zealand for a few months before heading up to his Kranji base for his future racing.